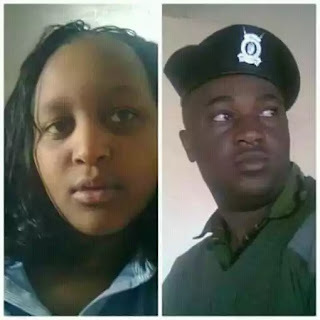 A police officer in Nakuru County, Kenya, shot his girlfriend dead before taking his life with the same AK47 rifle at their home in Freehold Area. CitizenTV reports that the police officer identified as Stephen Mungai Kinuthia, who was stationed at Molo Police Station, shot his girlfriend three times. Also speaking from the crime scene of the incident, neighbors said they heard a child shouting “baba anaua mama!” meaning, ‘father is killing mother’ before gun shots rent the air. According to neighbours, the woman had only lived in the apartment for two weeks and that the police officer was a frequent visitor. The County’s police Public Relations Officer, PPRO, Nakuru OCPD, Joshua Omukatta, told the TV station that “police started a probe to establish what transpired. He further disclosed that “Their bodies have been taken to Nakuru County government mortuary” as investigations continue.